Ryan Kwanten’s film, Northman – A Viking Saga will get a west coast premiere. 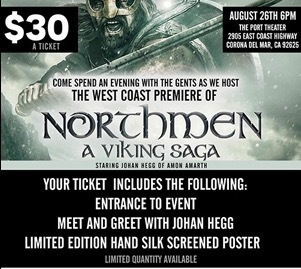 Metal Blade Records and Violent Gentleman are teaming up with Starz and Anchor Bay Entertainment to screen NORTHMEN – A VIKING SAGA on August 26th. The screening will take place at The Port Theater in Corona del Mar, CA at 6:00pm. Tickets are $30 and include: entrance to the event, a meet and greet with AMON AMARTH vocalist Johan Hegg, plus a limited edition hand silk screened poster! The Port Theater is located at 2905 East Coast Highway, Corona del Mar, CA 92625. For more details, visit portnewport.com. For tickets to the screening, head to violentgentlemen.com. Anchor Bay Entertainment released the action-packed Viking film NORTHMEN – A VIKING SAGA on Digital HD by Starz Digital on July 31, 2015, and on DVD, Blu-ray™ and On Demand on August 11, 2015. I would really like to see this one. I hope it comes my way.